Through working in close proximity to the heritage city of Bath, we are fortunate to see some of the most beautiful architecture this country has to offer. This project was no different. Earlier in the year, we were commisioned by a family to draw up designs for new fitted furniture to compliment their Grade I listed townhouse. 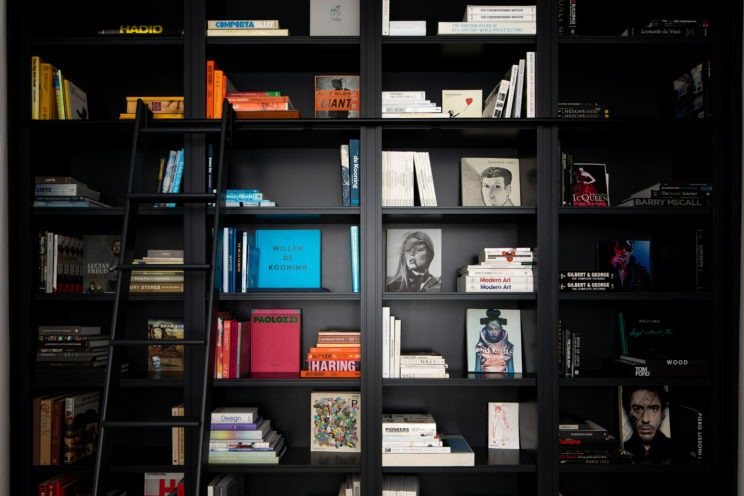 The family were looking to create a fitted library in their front reception room and also a fitted boot room and lobby. 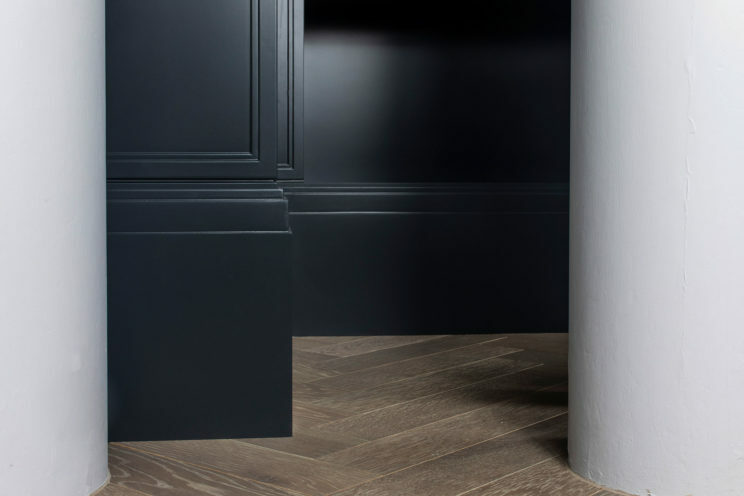 Both of these bespoke pieces required a huge amount of attention to detail from our designers and makers. 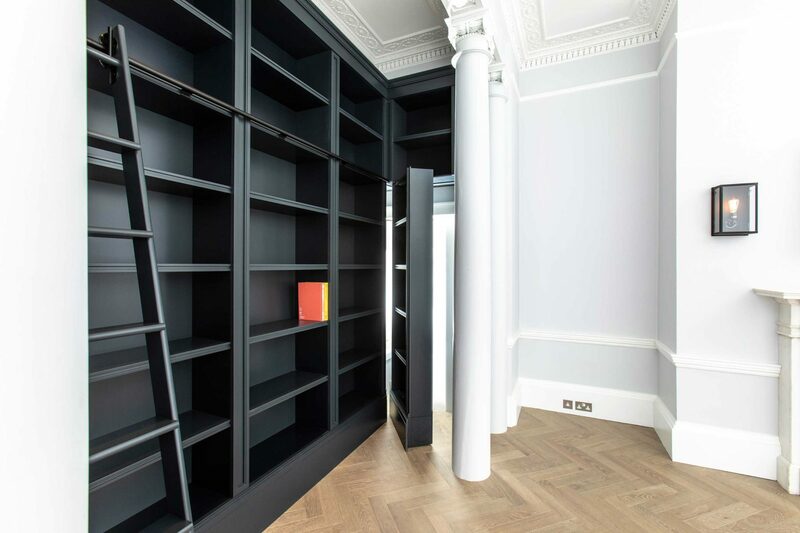 This was not only to ensure they fitted perfectly within these listed walls but also to ensure they complimented and beautifully matched the Georgian architecture inside. After several visits to our client’s home and much discussion with the couple, BB designer and director, Tom Jones-Marquez and designer Alex Hobbs created the final design plans for their library. 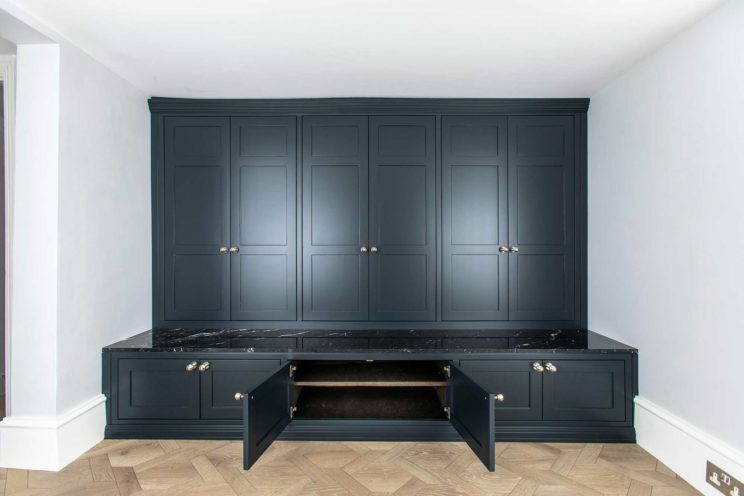 The designs then went into the workshop, where skilled and experienced cabinet maker Neil Castley got to work, with our experienced in-house paint team finishing this impressive piece before fitting. 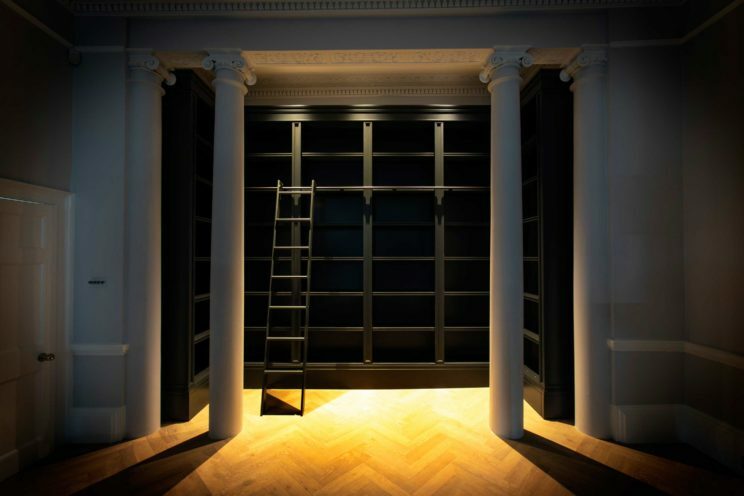 The library sits in the front reception room of the home, behind the existing Georgian pillars, and will house the family’s extensive book collection. As well as its impressive size and aesthetic, the library also includes a secret doorway which can be opened up to access a small storage room behind. 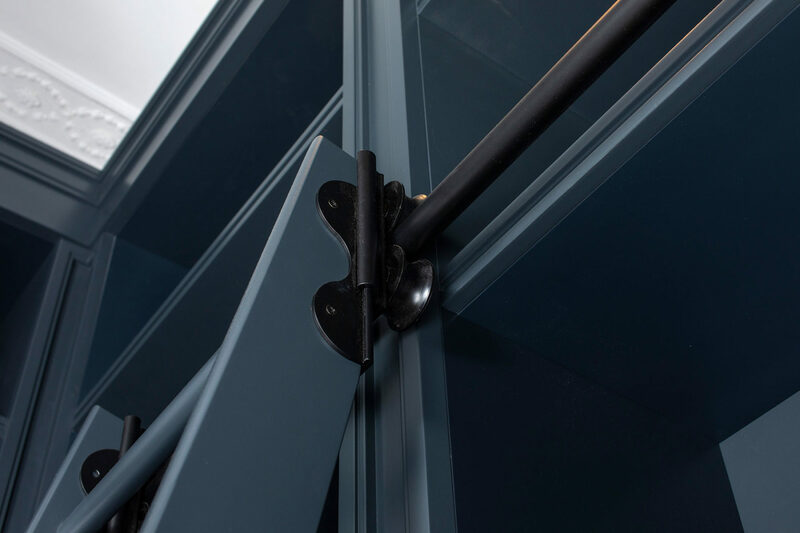 This clever feature required a bespoke pivot system to allow the door to open and close in place. 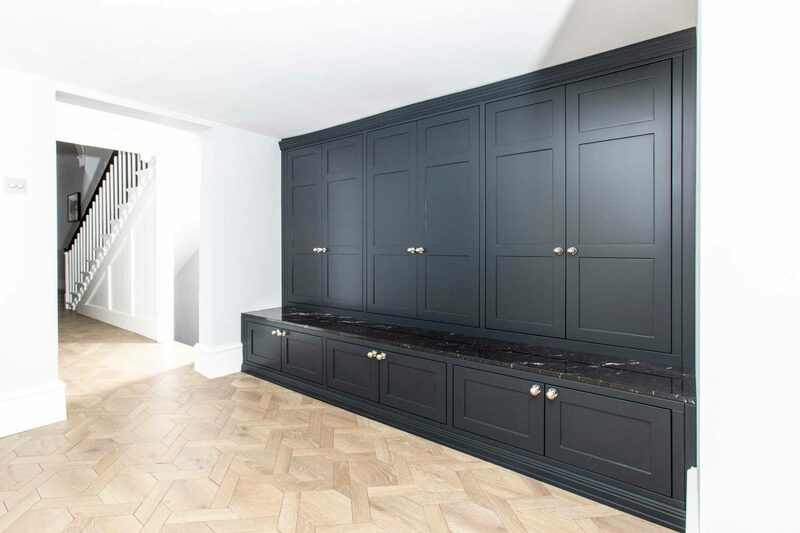 Carefully created from Tulipwood and FSC Accoya, the bespoke library was finished in Farrow and Ball Railings with an eggshell finish. We also created a sliding staircase with The Library Ladder Company, for easy access to the books above, using solid hardwood. As is the case for all of our furniture projects, we paid close attention to the existing architecture in the room and complimented the original Georgian mouldings with our modern take, using square edged mouldings but maintaining the proportions. Alongside the library, we were asked to create a boot room and lobby for the family. This would sit within the adjacent rooms to the hallway. Storage was key to the boot room, and we created floor-to-ceiling cabinets with ample space for hanging coats and storing shoes. 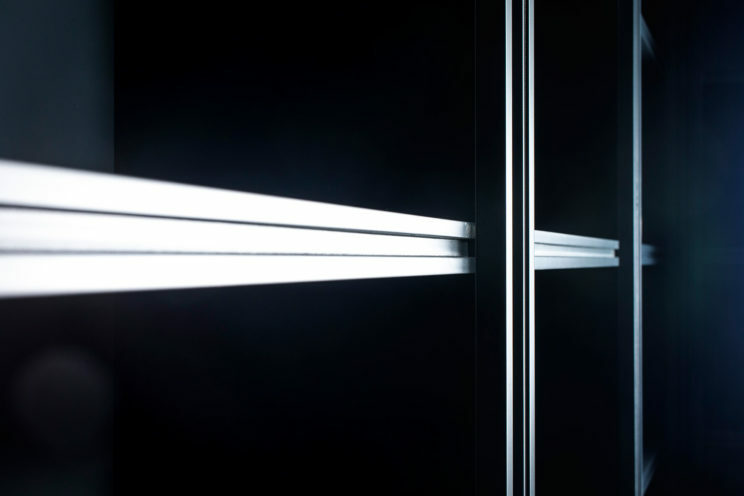 We created the doors from FSC Accoya timber, with the internals created in crown cut oak. Our in-house paint team, then carefully finished the externals in Farrow and Ball Railings which matched the library. It’s a really elegant, timeless colour. 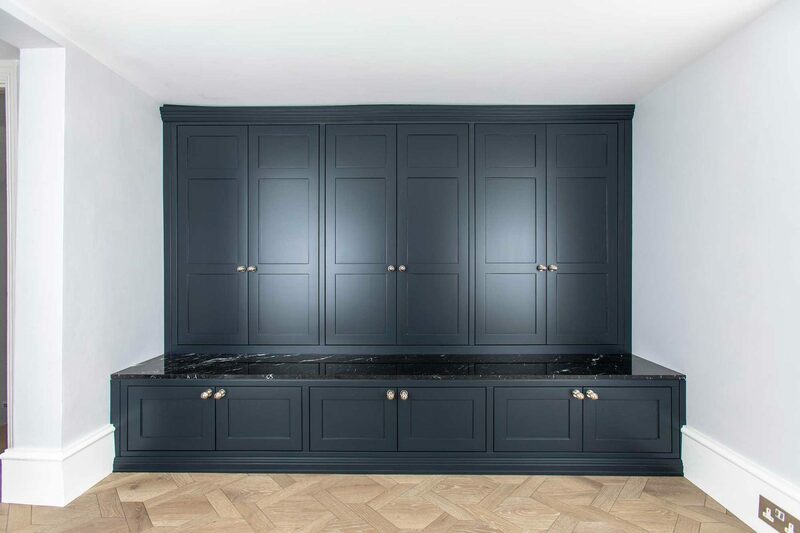 We also fitted a Nero Marquina marble top to compliment the style and colour of the cabinetry. This high quality, black stone marble is extracted from the region of Markina, in the north of Spain, and offered the perfect finish to this elegant yet functional piece of furniture. As is often the case with older, listed homes, we had to carefully scribe the cabinets into the uneven ceiling, for a smooth, clean finish.